No matter where your off-roading journeys take you, you’ve got to be suited up with a vehicle that can handle it all. And with a legendary champion like the 2018 Toyota Tacoma as your next adventuring sidekick, you’ll effortlessly tackle anything the roads of Avon, Indianapolis, and Plainfield throw your way. To learn more about just how far this truck will go to support you, let’s dive into this 2018 Toyota Tacoma review by our team at Andy Mohr Toyota. Before long, you’ll be surging along gravel, dirt, and mud in the throne of this muscle maniac. While you’re coursing along the landscape on an exciting, weekend jaunt, make sure you’re armed with all the tools to expertly manage unexpected dips in the road. That’s why the 2018 Toyota Tacoma offers 2.5-inch FOX Internal Bypass shocks, which help regulate excess bounce for a comfortable ride over rocky turf. And thanks to features like the optional Rigid Industries® fog lights, dark paths will be perfectly illuminated so that you’ll never have to strain your eyes to see what’s ahead. 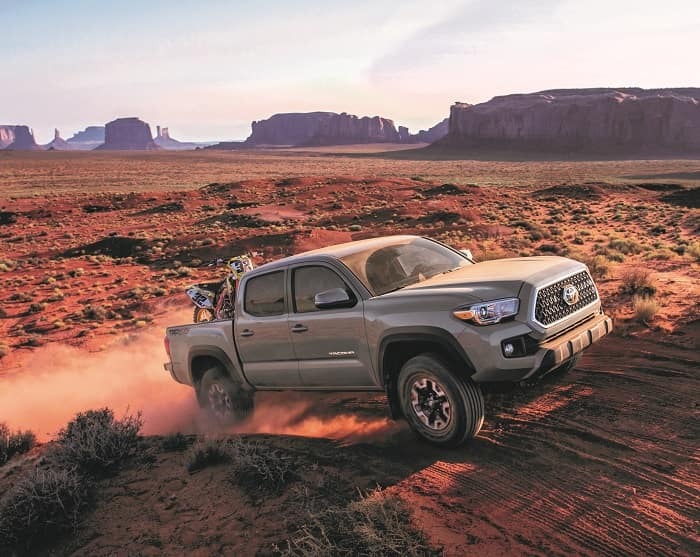 If you’re looking for a punch of power that’ll have you leading the pack down the highway, the Toyota Tacoma features a standard 2.7L engine that churns out 159 horsepower and 180 lb-ft of torque. Taking a step up, the available 3.5L V6 motor assaults the asphalt with 278 horsepower and 265 lb-ft of torque. With either of these robust turbines, your truck will quickly soar past other vehicles on the highway. With your friends in the back seat of your car, it’s important to keep everyone entertained, especially during long road trips. 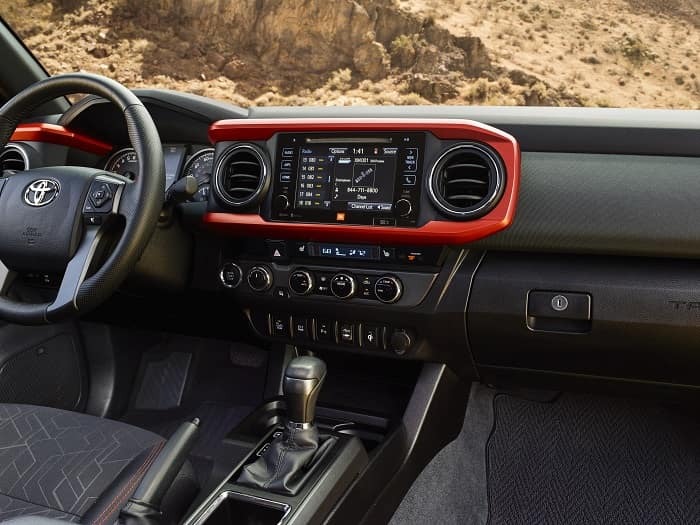 Thankfully, the 2018 Toyota Tacoma interior equips you with the standard Entune™ Multimedia Bundle, which operates using a 6.1-inch touchscreen. Need some guidance to your next vacation getaway? If so, opt for the available Entune™ Premium JBL® Audio with Integrated Navigation setup that offers turn-by-turn directions to your destination. And by accessing the 7-inch display, you’ll also connect to tools like HD Radio™ predictive traffic and Doppler weather overlay, so that you can avoid gridlock situations. Once you’ve set sail down your route, you should have the peace of mind that comes along with a suite of intelligent safety amenities. And inside the 2018 Toyota Tacoma, you’ll be protected by a collection of collision-preventing devices, all of which will sound the alarm when a dangerous situation is detected. When furnished with these innovative technologies, you’ll receive audible or visual alerts if your truck senses a potential accident. That way, you can take all the necessary actions to keep your friends and family out of harm’s way. Test Drive the 2018 Toyota Tacoma Today! At Andy Mohr Toyota, we know how excited you are to begin your next excursion along the terrains of Avon, Indianapolis, and Plainfield. So, when you’re ready to hit the road once again, make sure you’re armed with the expertise of the 2018 Toyota Tacoma. To explore more of what this tough truck has to offer, don’t hesitate to stop by our showroom or schedule your test drive today!